Armstrong was one of the Gods that lived on Godworld, the melting pot of offspring of the Gods, whose numbers had grown out of control, overpopulating the realms of the Elder Gods. She was present when Dragon and his allies arrived on the planet and fought against them until AllGod put an end to the conflict. Herakles was dispatched to Earth to retrieve all remaining godlings and demi-gods on Earth and took a small unit to accomplish this goal, the God Squad. This team were initially very successful but when they targeted the Special Operations Strikeforce for its godly members, Zeek utterly decimated them. With this mission a failure and with Godworld being destroyed, the Gods all relocated to their city of God Town. 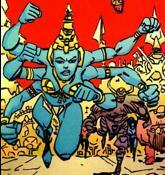 Armstrong was a resident here until its own destruction but she remained a member of the God Squad, assisting in both the defeat of the Forever Serpent and the capture of the renegade Thor.